Today we will discuss about Benson boiler. Benson boiler is also known as super critical steam generator which is developed by Mark Benson in the year 1922. This boiler can generate high pressure steam, which is further used in production of electricity and other industrial processes. It is a water tube boiler. In the early stage water tube boiler used to generate steam at the pressure up to 10MPa, which is known as sub critical boiler. Two big problem occur in sub-critical boiler. 1. First, in sub critical boiler water form the vapor bubbles at the tube surface, which decrease heat transfer rate, hence decrease efficiency. 2. The second one is, the sub critical boiler used the water steam separator drum to separate steam which make it too complex and heavy. It cannot be easily transfer from one station to another. To overcome these problems, in 1922, Mark Benson invented a boiler which works above su and generate steam at super critical pressure. This boiler is known as Benson boiler. This boiler works at pressure above critical pressure, at which the water instantly convert into steam. No air bubbles generate in this boiler. This boiler generate a high pressure steam which is used in various industrious processes. The Benson boiler is a water tube boiler, works on the basic principle of critical pressure of water. The critical pressure is the pressure at which the liquid and gas phase are at equilibrium. The water enters in the boiler at just above the critical pressure so it suddenly convert into steam without generating air bubbles. No air water separator drum is required. It also takes less fuel to generate steam. 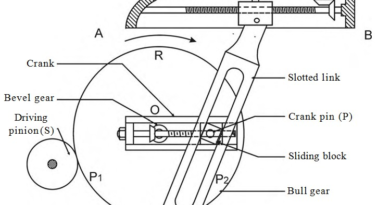 This is the basic principle of Benson boiler. It consist a great large tube. The water enter into the tube from one end and steam exit from other end. No water steam separator drum is used in this boiler. This boiler consist six basic component. Benson boiler is the forced pumped water tube boiler. The water is enter into the boiler at critical pressure A feed pump is used to pump the water into boiler. In this boiler air is preheated from before entering into combustion chamber. It increase the efficiency of boiler. Water from the feed pump enter into the tube which first passes from economizer which used the combustion gases to preheat the water which also increase efficiency of boiler. The water from the economizer further passes to the radiant evaporator, which use radiant heat transfer method to transfer heat from combustion chamber to the water. This section is near the combustion chamber. In the convective chamber, convection is used to transfer heat from the flue gases to the water. The water is completely evaporate in this chamber. This is the last chamber of boiler. The steam passes from this chamber, which increase the temperature of steam and this super-heated steam taken out for the industrial work. As we discussed this boiler works on the basic principle of critical pressure. The water is pumped at above the critical pressure into boiler tube. This water tube first passes through the economizer, which increase the temperature of water. This hot water further passes from the radiant evaporator where water is evaporate by radiant heat transfer. After that the water and steam passes through the convective evaporate where water is completely convert into steam. The water pressure is critical pressure so the water convert into steam directly without actual boiling. The steam is further heat up and this super-heated high pressure steam is taken out to rotate the turbine. 1. 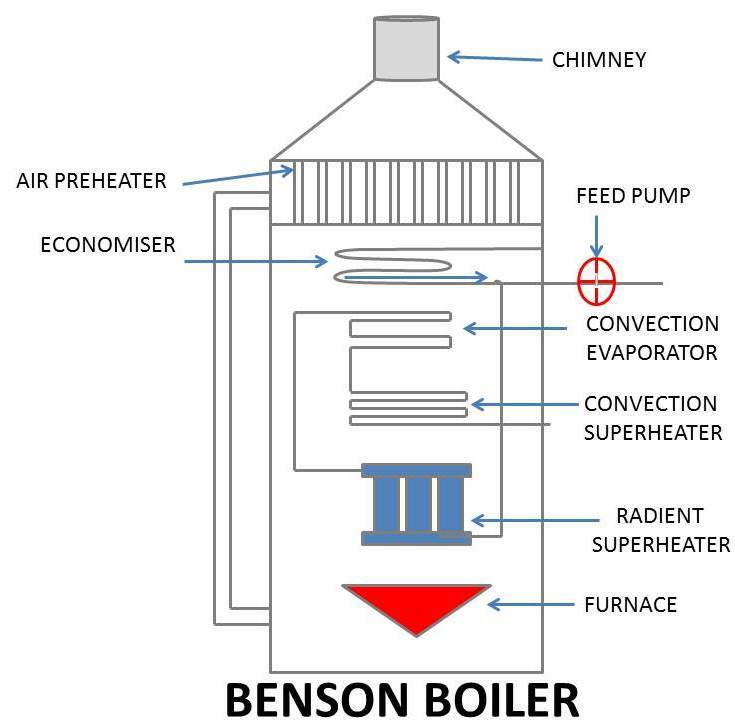 The Benson boiler does not use water-steam separator drum, which reduce the total cost of boiler. 2. This boiler can transport easily from one station to another. 3. It is economical and have higher efficiency. 4. This boiler can use over the pressure above 350 bar without changing the evaporator. 5. This can be start easily and can reach its maximum load capacity within 10 minutes. 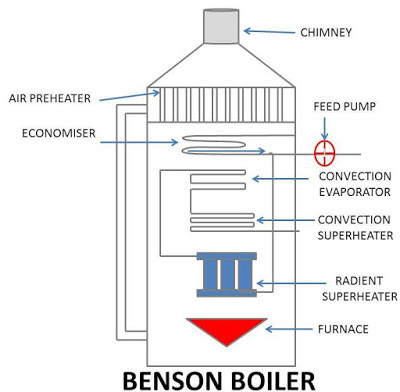 Today we have discussed about Benson boiler. If you have any doubt or query regarding it ask by commenting. If you like this article, don’t forget to share it on social networks. Subscribe our website for more informative articles. Thanks for reading it.